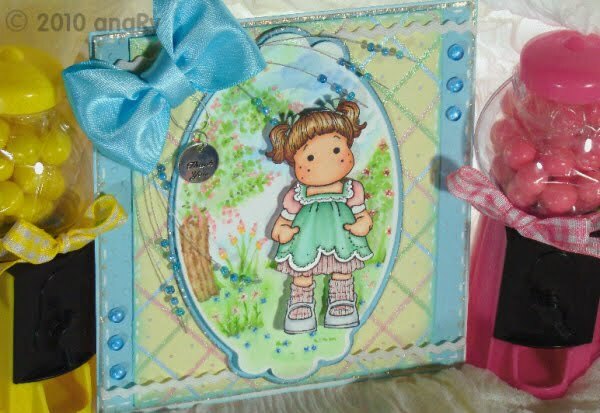 Magnolia Stamp :: Candy Happy! Hello Everybody! I am so glad you are joining the fun at my Candy! Don't forget to put your name in the linkz! If you need help, check the helpline at the end of the post! Well I am having a wonderful time reading all your comments. You have no idea how your words make me happy! It is so cool to visit you guys too! Now look who is also happy! My maggie! This is my latest idea. I used copics to color the magnolia stamp and also to create a little background for my little gal! I used what they call the blob method, heheh (have you read ilikemarkers blog?) to create most of the leaves and flowers. This was the first opportunity that I had to use my airbrush sys. Actually the copic airbrush feature actually was one of the first things that called my attention to these markers. I got a little copic happy and I forgot to list my colors! So forgive me! If you have any questions about colors let me know (just use the shout out box on the side or leave me a comment). I will be more than happy to share! I will add a a little This & That latter, okay? Thanks for dropping me a note! Candy time! We got Candy! AnaryAtelie! 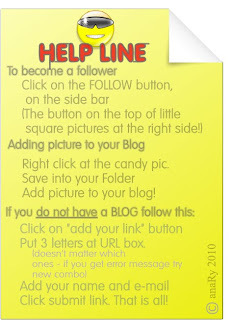 Hello, I added a help line at the end of the post! So check it out and join! Please don't forget to put your name in the Linkz list! Hey everybody! Guess who is bringing you candy?! YES!!! We have candy! Candy! Candy! This is my very first candy and I want to make one of you happy! I have never been this lucky BUT now it is your turn to be lucky! Come over and join me at this candy time! Spread the word and share the the luck! We will follow the general guidelines that are out there, okay? Everybody is invited!! Now the best for last! If we hit over 200 followers I will add a surprise gift that is right there in the blue candy jar! Yeah look at the picture, there is something in there (no, not the pearls hehe)! HA! I will give you a hint. It is a PRETTY TOOL! So let's gather around here and all that can be in your craft room! Thank you so much for helping out! 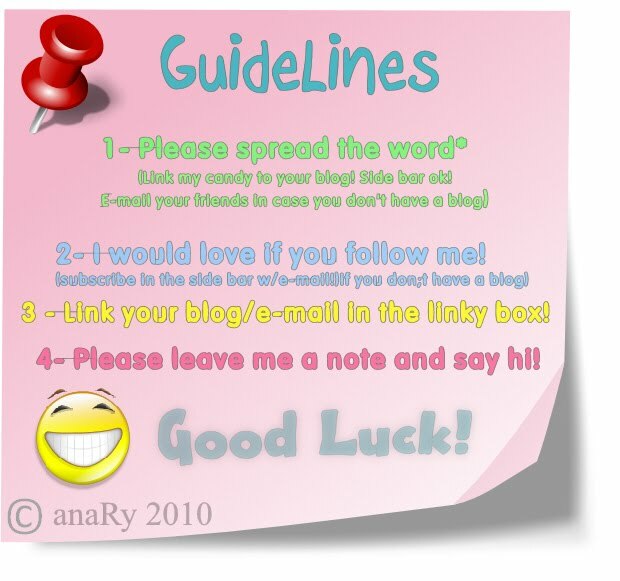 Please don't forget to add your name in the Linkz list! It will be hard to include you in the draw if you don't do that, ok? If the winner do not call in withing 7 days after the winner is posted at this blog I will reserve the right to make a new draw and pick a new winner. Thank you for your help! If you are out there and need a little idea for a last minute bunny gift. No worries. Just grab your Magnolia stamp and an acetate box (I know you saved one from that tool that you got last year; ) ) and some delicious chocolate (yes...the ones from that stash that your people don't know about heheh. See we got something in commum. Joking! Well I do have chocolate away!). 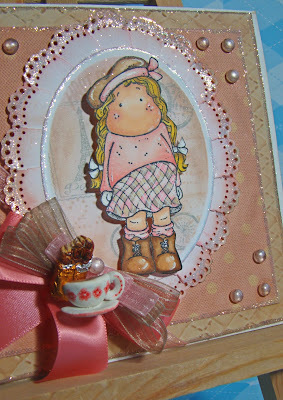 To make this little project I just stamped my Magnolia stamp with memento ink and colored with my trust worthy Copics. I used some spicas for a little touch of bling! The trick on this project is very easy. Make sure when you are cutting your image to fit in the box...you leave a belt. The belt will help keep your image right where you wanted it to be!. After you are done, just pour the chocolates and spruce it up with a nice ribbon! Voila! In a few minutes you will get a pretty package and for sure you will make quite an impression! Note: You can use this same principal to adorn a ton of other gift boxes too! Reuse, recicle, reporpouse! ¤ Markers & Pens:E00, E11, E71, E95, R000, R20, W1, W3, Rv00, RV06. RV13, RV23, V01, V17, BV00, BG000, BG01, BG72, YR65, Y02, Multinlines, Spica pens, White signo pen. 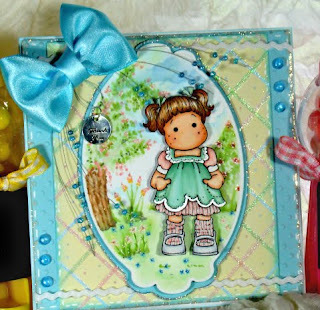 ¤ Embellishments: Ribbon, Thread, Gift ribbon. ¤ Embossing & Die cuts: Cuttlebug tiny tag. Magnolialicious Highlights : Acetate somewhere/Spring season. Yes!!!!!!!!! I was knighted by Sally (she is the sweetest thing!). I am now a Copic certified designer. I am joking about the knight thing hahha...but you that now hold that holly badge know the feeling : ). I travel a lot to get to that class and I had good time. My classmates were fun and very participative, lots of good questions were posted at the Q&A. I learned a lot and had a lot of insights and aha's moments! At the end of the day I was tired but with a good feeling that I was taking home a lot of good ideas and knowledge! I am in the mood to celebrate! I think I am ready to reveal my candy pic! I was adding goodies in the mean time : ). Come back to the reveal at the end of this week! Cheers! Magnolia stamp :: Spring ahead! Phew after a long weekend..I am pooped, but happy. That is what matters. The best part? The sun is shinning and the flowers are popping everywhere. Oh...how much I love to see the yellow from the daffodils, the new leaf green (Did I just mention a copic color?) and the purples of crocuses and pansies! Can you tell I love spring and the colors that come with it? : ). In anticipation on what to come and to celebrate mother nature I created this Magnolia card with huge flowers. 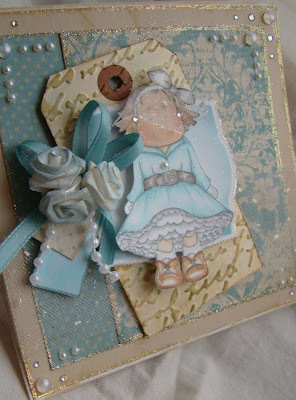 I love to add a little texture to my cards, so once more I reached for my adored micro beads. I created the center of my flowers with i-toppers, copic markers and yes you got it! Micro brads! The picture does not make justice to the yumminess on how this came out. If you have not seen i-top tool, go check it out. You can make your own brads...it is sooooo cool to use! To add a little extra touch of spring, I used mini jewels to mimic dew drops on the corner of my card. I will tell you, it took me quite a while to color the flower heads in that embossed background! Yes I am a nut, but I had so much fun! I really hope you liked this card, and I dream of more lovely inspirations coming from the season that just started! Happy spring and if you feel happy drop me a note here...I would love it! Now hurry to Magnolia Stamp Lovers and participate on our latest challenge! Vivi is hosting a die cut challenge! Come over and link your Magnolia card! You could win one of the newest stamps from Magnolia. The bride and groom! Thank you Cindy for sponsoring the goods! I entered this card also on Cinema Saturday Challenge. This is a great challenge blog! The gals choose 13 going into 30 as movie of the week...and I think my springy youthful gal would fit the bill!! Doesnt she look like naughty little girl? ¤ Markers & Pens: Copics YG00, YG06, B00,BG01, BG72, BG49, R000, RV23, RV35, RV39, E31, E33, Y15, YG03, E00, E53, E71, E95, multiliners, Spicas, White signo pen. ¤ Embellishments: Twikle Jewels, microbeads, i-top brads, ribbon. ¤ Embossing & Die cuts: Cuttlebug embossing folder swiss dots, Sixxiz embossing folder flowers and dots, nestabilities. 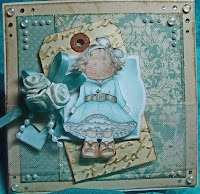 ¤ Paper: DCWV and cardstock. ¤ Tools: i-top, sizzix big kick, silhouette. ¤ GO get your Magnolia at stampingscrapping.com. You will get it before you say I love Maggies! Cinema Saturday : 13 going on 30 - Shapes. Magnolia stamp :: All dressed up for the occasion! Oi (hello in Portuguese!) everyone! Well, my Maggie collection is fairly small...so I try my best to dress them up! Remember the days the ladies wore white gloves? My inspiration came from that time. So for this card I spruce up my Maggie! 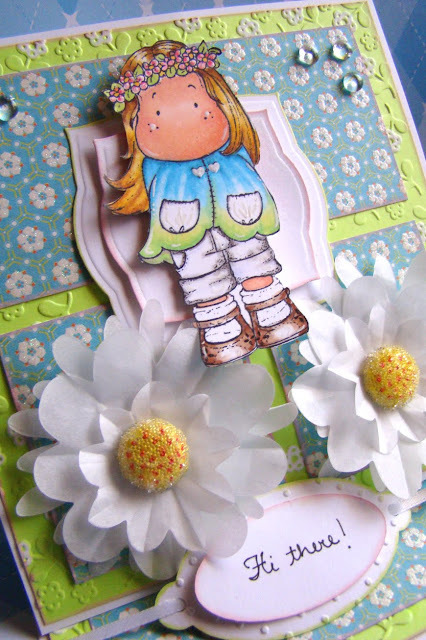 I am thinking to send this card as a Birthday card..I got a friend that she loved dress up! Check it out the hat veil! I am in a quest to use different ways of coloring...and this time I tried to keep my colors fairly muted. 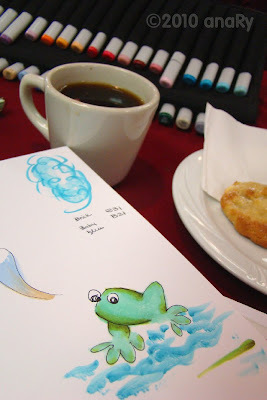 I just really loved the possibilities that all those yummy Copic colors offered (it is pricey, but oh worth it!). I would love to hear what you guys think! How do you like the make over? PS: Oh...keep in touch to find out what in that candy basket! It is good...maybe I should keep it.. Nah... You guys deserved! ¤ Markers & Pens: Copic, B000, B0000, BG10, BG72, YR0000, R20, R0000, E00, E25, E31, E35, E40, E41, E71, W1, W3, W5. White signo pen. ¤ Ink & stamps:Magnolia Stamp, Memento, Distress and Versa Magic Inks. ¤ Embellishments: Pearls, 1/2 pearls, glitter, rhinestones, Hand painted roses, ribbon and tulle. ¤ Embossing & Die cuts: CB Script embossing folder, Nestabilities. ¤ Paper: Carstock, K&Co and tag. Hello everyone! Oh my, thank you sooooooo much for your words! I love to read all the comments you guys leave here...it is so encouraging! It makes me feel that I am going in a good direction! Well, as I said in my last post I am preparing a candy...and I decided to give you a sneak peak of the goods (aha! Not very easy : ) )...humm let see if you guys can guess the stuff..: ). I am in a mood to make a really nice one...and maybe throw in some more stuff as we go, if we can get a really good crowd! The more the merrier and more fun! So follow up! I want to see you around when I reveal this gooooods! 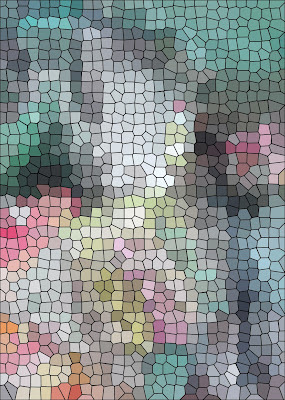 Maybe I will clear this image until the reveal! Hello! Isn't funny when you get out of your comfort zone all of sudden you become more efficient? 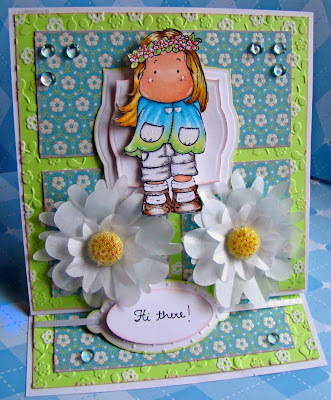 Well this is my story with my new Magnolia card! People I had a blast making my Tilda in the swing! *** Shhh..I will have a Candy happening soon...so subscribe! I would love you to be here to have a chance to win something gooood! ¤ Markers & Pens:E00, E11, E13, E25, E95, N1, N3, W3, R81, R22, R24R81, R83, R85, B00, B91, G20, Y00, YG0000, YG05, YG05, YG23, YG63, C3, Signo white marker, multiliners. 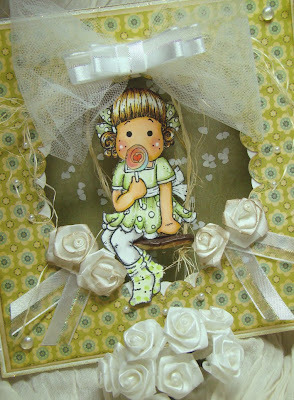 ¤ Embellishments: Robbin's nest, tulle, ribbon, Glitter and handmade embellishments, raffia. ¤ Magnolias stamps and other items on this list can be found at stampingscrapping.com! Hello everyone! The word of the day is pamper. Yes, yesterday was international woman's day! So do whatever you feel like it! Take easy, relax, get yourself something nice...drink that forbidden hot chocolate with a peak of nice whipped cream! Dance, sing, read a delightful book, take a nap with a gorgeous eye mask, give a speech...it seems like we've earned : ) (Yes we did!). Hey the boys got their day....or what do you think "The super bowl:" is? .heheh. ¤ Markers & Pens:Copic Roooo, R22, R81,R82,B000, BG0000, BG000,BG15, BV000, BV13, YG20, YG21, YG23, Y000,Y23, Y32, G20, YR0000,YR24, E0000,E00, E02,E11. Multiliners, prisma markers liners, White signo pen. ¤ Embossing & Die cuts: Cuttlebug embossing folders Rills, tiny mosaic, tiny bubbles, Die cut silhouette library (Samantha Walker), Ribbon, Glitter. ¤ Paper: Cardstock, DCWV Linen closet, Nennah paper. ¤ Tools: SizzixBig kick, Silhouette. Saturday Spotlight : Hey Girlfriend! 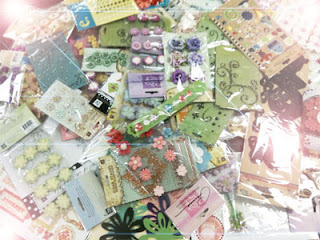 Magnolia stamp :: A bucket load just arrived! Calling all Maggie fans! 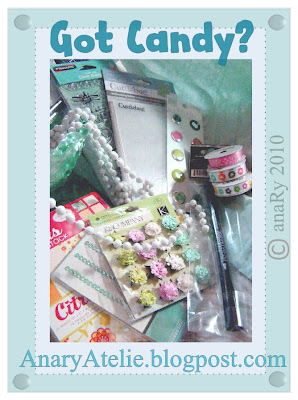 Cindy at stampingscrapping.com just got a bucket load of Magnolia stamps...brides, acessories, etc.Hurry!!!! The new stamps are flying out of the shelf so fast that I could not even see it! Come on in! Don't forget that after you get 11, you get a FREE MAGNOLIA STAMP (equal or less value). 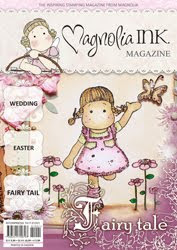 While you are there don't forget to get the fairy tale edition of MAGNOLIA INK!!! This magazine is so hot! Phew, I wanted so much to participate in the Bildie Challenge, Bring the Bling...that I push my craft gears and speed and here it is! My first Bildie Card! This image was a great piece for coloring...the whole card flowed without a single sketch! I will come back later with my this and that with colors and everything I used...I hope you like my newest friend. Oh, you can join too just go to Bildmalarna challenge! ¤ Markers & Pens: Copics Eoo, E11,E71, E95, Rooo, R30, W1, W2, Rv00, Rv06, Rv13, Rv23, V01, v17, Bvoo, Yr65, Y02, Bg000, Bg01, Bg72, Multiliners, spycas, white signo pen. 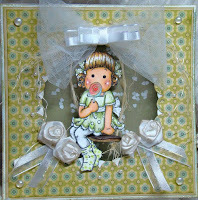 ¤ Embellishments: Rhinestones flowers, ribbons, gross grain tape, glitter. ¤ Embossing & Die cuts: Cuttle bug die cut mini labels, silhouette library. ¤ Paper: Nennah, cardstock various, DCWV. ¤ Tools:Sizzix big kick, silhouette, martha stewart punch. ¤ Bildmalarnas stamps and other items in this list can be found at stampingscrapping.com! 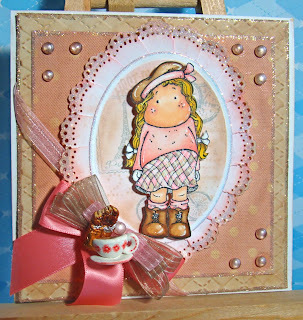 Magnolia Stamp :: Pink & Chocolate :: Chance to Win a Magnolia INK at MSL Challenge! Hello! This week's challenge at Magnolia Stamp lovers is YUMMY! Not only the theme of this challenge is Pink & Chocolate, but the winner will receive the FAIRY TALE edition from MAGNOLIA INK! Yeah, you got it right! One of you will receive one of the hottest magazines in the world of stamping today! Thanks Cindy! I am soooo excited for you all!!! When I came across the theme for this new challenge..one thing came to my mind...coffee, chocolate and a romantic set! So I said: "Why not Paris?!" (of course the dog was looking at me like...what the hell?!!). 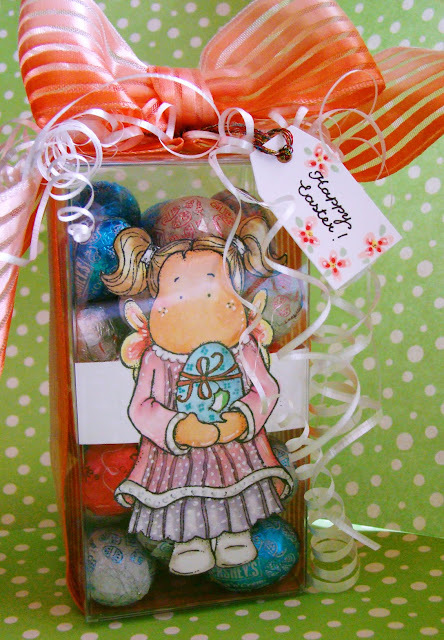 The next step was to look thru my clear stamps and find images to create the background. I was hoping to set the cafe mood for my Maggie. I also had an opportunity to create some hand made embellishments to give a little extra charm...I really had the best time making this little cup of espresso and a chocolate bar. Well, I guess now I better crank up the espresso machine! See y'all at MSL challenge! ¤ Markers & Pens: E00, E11, E31, E33, E35, E37, E53, E71, e95, O, y15, y17, rooo, r20 , r23, r35, r43, rv13, rv06, w3; White signo pen. ¤ Ink & stamps: memento tuxedo black, London fog, desert sand; distress burlap, lipstick, tattered rose; versa magic Sahara sand, pixie dust. MAGNOLIA pARIS sTAMP, CLEAR STAMPS VARIOUS. ¤ Embossing & Die cuts: Nestabilities, CB embossing folder, Martha Stewart punch. ¤ Paper: white CARD STOCK, nENAH PAPER,, dcwv MAT STACK. New Chance for something good! New chance Hurry..prima got something good coming out!